Happy Power Monday my friends! Last week I took a break from Power Monday, but it is back and I have a really good one to share with you all today. As I mentioned a few days ago, May is Celiac Awareness Month. This is near and dear to my heart because I have Celiac Disease and have been gluten-free for 5 1/2 years now. Being gluten-free is still given a huge bad rep by the media and general society as a fad diet. Everyone who is anyone is jumping on the gluten-free bandwagon thinking it will bring them magical health results and change everything wrong with their bodies. However, that is not the case. Being gluten-free is not a fad diet to those of us who suffer from the auto-immune disease, allergy, or severe intolerance to gluten. We life this lifestyle (not just a diet) because it is the only way for us to stay healthy and be able to function. If we started to ingest gluten, we would become severely ill, our bodies literally attack themselves, causing all sorts of digestive distress, headaches, reduced energy, weight loss/weight gain, rashes, joint pain, mind fog, depression, osteoporosis, severe nutrient deficiencies, sores, numbness, irritability, and that is just to name a few. If Celiac goes untreated, it can lead to cancer, long-term health disabilities, and even death. Being gluten-free is not something you should take lightly. It is a serious commitment and a necessity for those of us will the auto-immune disease to live. The scary thing is, some of us don’t have symptoms at all. You could have Celiac for years and not know. You could even have slight symptoms, but are diagnosed with IBS or even just a migraine disorder. That is why it is so important to get the word out and educate the population on what exactly Celiac Disease is. 1 in 133 will have Celiac Disease, about 1% of the population. Even with this being known, doctors are still extremely lacking in education on the disease and rarely diagnosis it. Most Celiacs figure it out on their own out of frustration and experimentation. Then they confirm it with blood tests or intestinal biopsies. But even with these medical tests, many results come back negative or give ambiguous results. It is just so hard to diagnosis. But if you know of someone in your family who suffers from Celiac Disease, you should get tested some way because your chances of having it are 10-fold. Now I introduce the 2014 Gluten-Free Challenge! 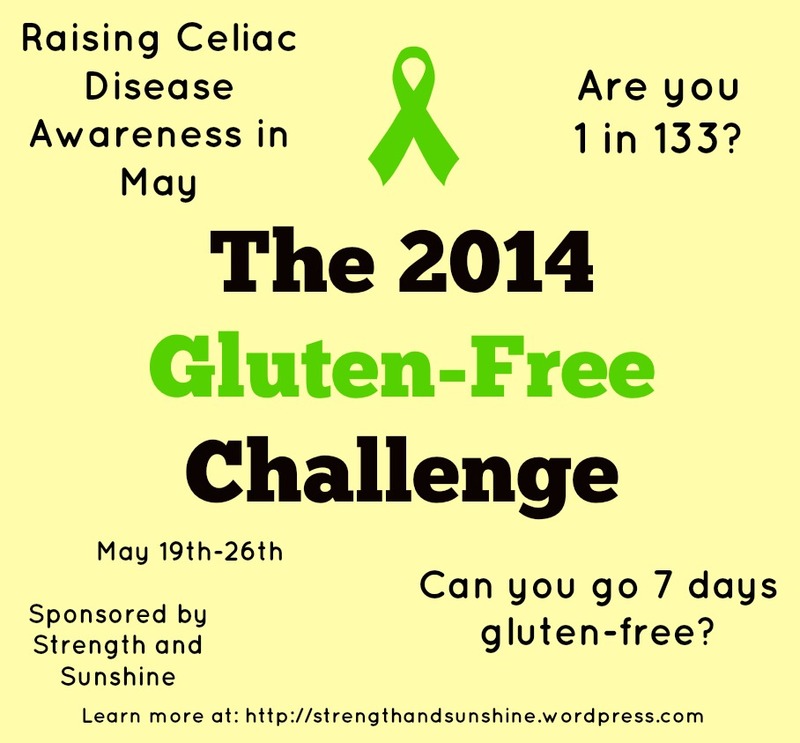 This challenge is to help raise awareness for Celiac Disease. For the week of May 19th-26th, I challenge you to life the life of a Celiac. Not to promote it as a fad diet, but to learn about and see what it is like to truly life gluten-free. During May I will be doing many posts on Celiac and gluten-free facts, sharing great recipes, and supporting the community. You will gain knowledge that you can impart to others on what is fact and myth of being gluten-free. You will also experience what it is like to live this way. Who: Anyone who wants to learn, grow, support, and raise awareness for Celiac Disease. What/Why: Raising awareness for Celiac Awareness Month. Where: Details and fun and informative posts on this blog. The week long challenge will take place right in you own home and life! When: May 19th (Monday)- May 26th (Monday). Requirements: During the week of May 19th, for 7 days, you will live completely gluten-free. That means no wheat, barley, rye, gluten, etc. (For a full list of off-limits ingredients click here). No cross-contamination either! No eating the frosting off that cake or picking the croutons off that salad. During this week, document your meals, thoughts, slip-ups, and successes. At the end of the challenge ) on Monday the 26th, come back to like blog and link-up your blog post with you experience with the challenge. If you are not a blogger, you can either write me an email or leave a comment and I will put it into the round-up of posts later that week. 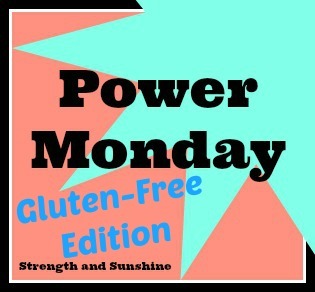 Prize: One randomly selected participant will receive a huge gluten-free product prize box from yours truly! Note: I will be posting sample meal plans and helpful tips over the next few weeks leading up to the challenge to help you prepare. If you would like to participate leave a comment below on this post! Feel free to leave any question or comments you would like me to address before the challenge to help better prepare you! You can also shoot me an email at strengthandsunehine(at)gmail(dot)com! I am really excited about this challenge and hope that you will learn a thing or two along the way. It is not easy being gluten-free, but it can be done and become just another simple aspect of your life. I really don’t think much about it now after 5 1/2 years. It isn’t difficult for me and has just become part of who I am and how I live. However, many people struggle with living gluten-free even after they have been on the diet for a while. I don’t want you to have to struggle. This diet should be allowing you happiness and freedom, not making you feel worse! So even if you are already gluten-free, feel free to join in! Let’s support one another no matter if we have Celiac or not! We need to build a strong community and help each other out. Here are some resources you can read up on to get you started! Make sure to grab the badge (copy and save it to you computer) and add it to you blog and post when you participate! It will help spread the word! Also use the hashtag #GFC14 in all you social media shoot outs and mentions! + Will you be participating? + Have any questions you want me to address in upcoming posts? + Have any questions about the challenge? I hope you all join in! I think this will be a fun and eye-opening experience for all! Feel free to recruit you whole family or friends in this challenge with you. The more support you have, the better! (P.S. Happy Cinco de Mayo! I really don’t understand why Americans celebrate this though. It is a Mexican holiday…not ours. Why do we steal holidays? Haha, anyway, Have a beautiful day and make some gluten-free Mexican food anyway! 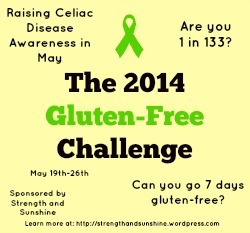 I am getting a biopsy to confirm blood tests on my Celiac status next month so this is a great challenge! Well then all the more to join in! Let me know if you need any help or support! My sister is gluten free and I am “partially” gluten free. Most days I avoid it. By doing that, I’ve realized it wouldn’t be all that hard to go completely gluten free. I would love to join the challenge! I’m not quite sure that I’ll be able to last all 7 days, but I’m up for giving it a try. Give it your best shot! I bet once you start, you will realize that it isn’t so hard once you fully commit! Haha! Its great when we can ultimately learn something about our illness or self and are able to make ourselves the healthiest possible. I have ulcerative colitis and I’m wondering if some of my problems would be solved by going gluten free. Honestly, the thought of policing everything I eat stresses me out but I think I can handle it for a week. It’s worth giving it a try. Digestive disorders like UC and Crohns can be linked with celiac and you might find success with being GF. Definitely try! Its not hard, like I said I rarely even think about it now! I think awareness is so important! I wish that being GF were a choice (and that it was a diet). Either way, I’m happy to be healthy! I appreciate my illness and am actually glad I have it. It has taught me so much and has opened me to so many new food and cooking experiences and knowledge! That’s a great way to look at it – and I agree, it has definitely widened my food horizons! I have done a lot of research on the gluten free fad diet and it really bugs me when people praise it for weight loss, etc. I have had to cut back on gluten via my fructose intolerance and should do the elimination diet/fod maps to help get a sense of what I should and shouldn’t eat for my IBD. Ill join in the challenge for sure! Awesome, I am so excited to have you on broad! Yes, my biggest frustration is with the weight loss aspect! People who have Celiacs usually gain back weight because they have been deprived of nutrients for so long! What a fantastic post! It’s awesome that you’re putting this info out there. My sister was diagnosed with CD in 2007 and there wasn’t a lot of info available then. It’s frustrating that it’s become a “trend,” as most people don’t take it seriously -I know this can be especially annoying when you dine out! I hope that one day more people will recognize the severity of this autoimmune condition. That is my goal and hope that it will be seen as what it truly means. It is a severe medical disorder and should get the acknowledgement it deserves. Don’t worry, haha it makes me so mad too, you have no idea! Being gluten-free is the furthest thing from going on a “diet” it’s is gross and sad that people even think that.